TW and Pop went to the third annual Paw Fest a few weeks ago. It was the first for them. They braved cold temperatures, winds gusting to 20 mph and drizzle to check it out. Of course they left the stunning cat at home. 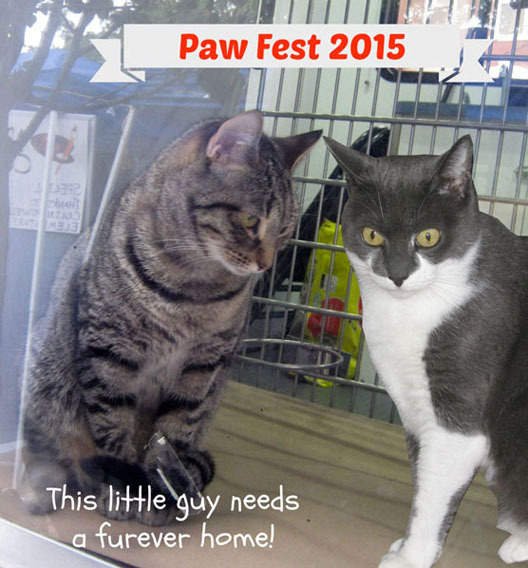 The Paw Fest is sponsored by The Lucky Cat Rescue (TLC) and Hudson County Friends of Ferals. The North Shore Animal League lent them their adoption van. There was DJ music and Michael Longoria, who played Frankie Valli in the Broadway hit Jersey Boys, sang their hit “Can’t Take My Eyes Off of You." You couldn't sneeze without running into a woofie or two. They were participating in agility demonstrations and a pet costume contest, among other entertainment. TW thought some little blue pit bull puppies were da bomb. There were four of them and their mom. TW squatted down on the cold ground and those pitties and their mom were crawling all over her! Didn’t they know she’s a CAT PERSON? The fest also served a purpose in the community as the People for Animals was giving free rabies vaccinations and low-cost microchippimg. Lots of pets were lined up in the drizzle to get shot. This is extremely important in an area with a large population of low-income families. The highlight for the peeps was the van which housed the adoptable kitties and some adoptable dogs too. There was a steady stream of people coming in to see the kitties and many were filling out adoption forms. TLC confirmed that two cats were actually adopted, which is disappointing but it’s still a couple of kitties who now have forever homes. TLC works in the Hudson County, NJ community to reduce the number of homeless cats by trapping, neutering and returning healthy feral cats; adopting out friendly cats (neutered and vaccinated) and through education and outreach programs focusing on animal health, safety and pet retention. They have a “Foster-to-Adopt” program where you can foster for a two-week period before adopting to be sure the cat is right for you and your diva cat will accept an introoder. Events like this are fun and bring the plight of these homeless cats to the public’s attention. In today’s busy world, you have to bring the kitties to the public rather than get the public into shelters. TNR rescues such as TLC don’t necessarily have shelter facilities so these adoption events provide an outlet to find homes for their rescues. NJ.com has a cool photo gallery with lots better pics than TW took. Follow TLC Rescue on Facebook. If you live anywhere near Bayonne, they’ll have some adoptable kitties and woofies at Trinity Church on October 17th. There will be refreshments at this fall festival as well. This is my post for Blog the Change 4 Animals and part of a blog hop. Unfortunately, their web site was hacked but the show must go on! What an awesome event! You are right, CK, the shelters and rescues need to take the homeless kitties to the public! That sounds a wonderful event. It's great at least two kitties found home. I hope many will follow. And I agree, you gotta bring kitties to the public. That would promote awareness and adoption. Wonderful event and especially generous for another rescue to loan their van so the cats could be inside. What a great event. We just had our MegaAdoptAThon here last weekend and 782 new forever homes were found! Isn't that great? The only sad part is the shelters/rescues will once again be overloaded with new pets in just a few days. It's never ending. The event sounds like it was a lot of fun. I love the Foster-to-Adopt program you talk about - what an incredible idea! I think more shelters should definitely consider doing these. What a great event! It is so true that adoptable cats need to be publicized more because not enough people walk into shelters to adopt. What a nice event and we just love human helpers like that! Thanks so much for joining the hop today. What a fantastic event. I love that vaccinations and microchipping were included! Sounds like a great event. I hope all these kitties get their forever homes. That sounds like a great event. I hope more kitties get adopted. Dat is soooo pawsum CK. Weez soo glad yous peeps got to go and it sounds like a gweat purrogwam. It's sad dat only 2 kitties got homes, but at least dat's 2 more kitties dat have a pawsum furever now. What a fantastic event. We especially love seeing the free rabies vaccines and low-cost microchipping. One of the things we read about the cat victims of the fires in California was that they were a lower income area and that many of the rescued cats had never seen a vet or had a vaccination before. There's real need for that in so many places, and we're happy to hear that it's recognized in your area! We hope that more of the people who saw cats at the adoption event think about it and then go back to adopt the kitties they met, too. It looked like a great event, CK. We love these types of events that promote low cost vaccinations, microchipping and adoptions. I am such a huge fan of events like this; it gives so many more people the opportunity to adopt - or at least see the awesome animals in need of homes. And of course the low cost clinics are always much needed - they make such a huge difference in communities. I love when communities do events such as this. I'd love to see them including some animal education in there too! Events like these do so much for families and animals in need, how wonderful TW attended to show support. I was adopted by Clove at a pet store event that a local rescue uses to show kittens and cats who are looking for forever homes, potential humans they can adopt. A cat with special needs, she was scared by the atmosphere and people passing by and those who wished to meet and greet her. Her response to all of the other interested humans involved a nip of the teeth or a whap of sharp claws. When I approached she did not administer either to me and allowed some pets and scritches, in the end of the visit announcing that she had made the choice to accept my servitude. How honored and excited I was! A year and a half later I am forever grateful I made the cut and to the rescue who took her in and helped make my life better. These events are pawesome as it was at one where our local rescue provided some of us royal rescue kitties with potential humans to adopt that I found and decided upon my human to become my servant! What a terrific idea - sounds like a fantastic event! Kudos to TLC and rescues like them, they are so very much needed. The work they do is invaluable, the services they provide their community priceless. I love how you worded it that you need to bring the kitties to the public - so true! Wishing much success for TLC in all their endeavors. Thank you for blogging - and being - the change for animals!